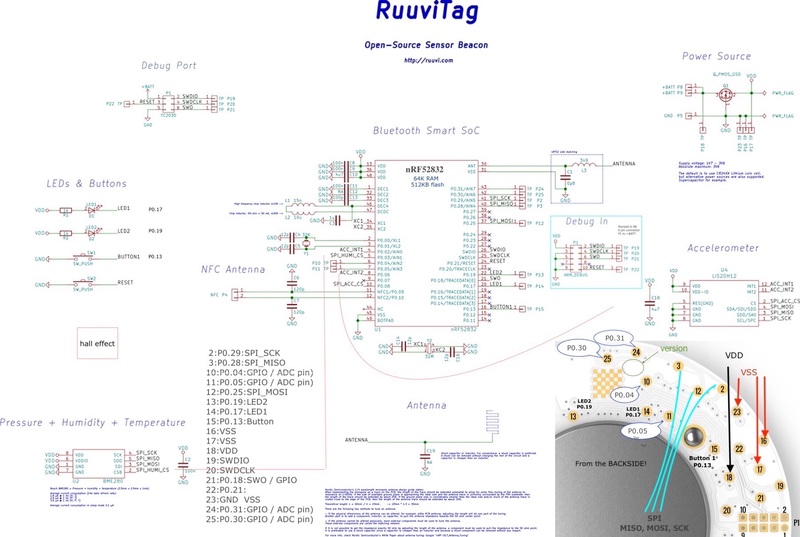 The Ruuvi Tag is distributed ready to transmit environment data packets periodically in either URL or highres (raw) mode. The (very) faint blinking of the green LED indicates URL mode while the red LED indicates raw mode. The mode is changed by pressing the B button on the tag. Be sure to enable Bluetooth in settings on the Phone. Phy By BKON Connect to retrieve the web page which intreprets the packet and dislays the data, For example. Swipe up and click $ . Then swipe left to Add Widgets and select nRFconnect. After a few seconds a link will be presented. Tap it to display the Temperature, Humidity† and Atmospheric pressure data. There are also android apps that can display the data directly. See the getting started video. There are also applications which issue a notification whenever a new beacon is detected. When the tag is in highres(raw) mode packets can be processed by an android phone running the ruuvi app or open beacon. Another option is to establish another device such as a raspberry pi to receive the packets and run a progran to intrepret the data. ADV_NONCONN_IND - Non connectable undirected advertising(31 bytes) (not ADV_IND(31 bytes) , ADV_DIRECT_IND, 6x ADV_SCAN_IND(31 bytes)) 23 ?? Max length for BLE 4.0 is 31, BLE 5.0 254. For users who want to custom process the data. This format does not contain a URL and is not used by the ruu.vi web page. See Tomi Tuhkanen's ruuvitag_sensor or Henrik Heikkil's ruuvi Collector . or custom reader/interpreter and additional hardware for receiving . The data is decoded from "Manufacturer Specific Data" field, undirected, non-connectable bluetooth advertisement. More details are at Argenox . Current sensor readings transmitted at 1 second intervals. ruuvi's manufacturer ID is 0x0499. Note that there are Bluetooth Generic Attributes (GATT) services specifications for services including ESP Environmental Sensing Profile, which include Humidity but those are NOT followed here. 2047 (FFEx or FFFx) indicates an invalid reading. highest valid value is 254, with 255 is reserved for the "not available". 16 – 17 0 — 65,534 Measurement sequence number (16bit unsigned). 65,535 indicates not available. Each time a measurement is taken, this is incremented by one. 2 -40..85 Temperature (MSB is sign, next 7 bits are value (akward?) centigrade. Humidity : 0% to 100% in .5% increments. Temperature: -127.99°C to +127.9 °C (well over boiling!) in .01°C increments. Acceleration -32000 to 32000 (mG), 16 G max (2 G in default configuration). ToDo: "special" values to indicate error. The Ruuvi packets are embedded within an Eddystone URL frame. Which begin at offset 25 within the packet. The purpose for this (and other URL formats is to provide a means for users familiar with web programming, who are not familiar with C programming and the toolchain, the abliity to process the data from the tag. 1 -100..+20 TX Power Calibrated Tx power at 0 meters. This allows for estimating the distance to the tag. This allows only 10 characters for the beacon data which must be printable and cannot contain most special characters. (an address of the form XYZ.com/ or XYZ.info/ would allow 12 characters since a code could be used for the TLD and slash). The beacon data is encoded using a base 64 scheme* This causes 3 bytes to expand to 4 characters; 6 bytes expands to 8 characters. When viewing the packet with a diagnostic tool or the URL in the address bar of a browser it is this string of characters which is visible. This allows the default web page, index.html, to provide the decoding algorithim and page formatting. The data from the beacon is specified as the fragment identifier. Since the fragment is NOT transmitted, the web site cannot process any information other than the time and IP address. Fomat 8 addresses that. URL Formats that do not include the fragment (#) identifier introducer allow for 11 beacon data characters or 8 binary data bytes. This means that the web page must be the 404 error handler since the data from the beacon will not specify an existing page. 16-239 10-F0 reserved bi directional? As there are a limited number of format types available without sacrificing bits for data, a change in format type is only necessary when the format is incompatible. For example using previously unused bits will not be reason to change the format type code. This means that if a field has a range of 0-124, is right justified in a byte and is in a field documented to be 7 bits wide do not assume that the high order bit will be zero. For example, a reference to the first byte, the low order bit is: b.7 aka b'0000 0001'. No time known as any counter would over flow. 2 critical 2.25< vbat < 2.29 Frequency of activity reduced further. Frequency of activity reduced further. No sensors polled. Attempt to keep transmitting as long as possible. Users who need humidity more precision undoubtedly use format 3). (Users who need more precise temperature undoubtedly use format 3. 4/17/17 Uses https://ruu.vi/index.html web page to intrepret and display. Uses https://ruu.vi/index.html web page to intrepret and display. 3 0 Temperature Fraction, 1/100.). Set to ZERO because nearby causes notification on slight changes. Open Beacons version 1.0 as of 4/10/18 displays and intrepertes data from all current ruuvi formats. BLE scanner(bluepixeltech.com) is good since it displays the URL in text and provides a link to tap on to see the run.vi page. Physical Web Beacons by BKON includes a widget you can add to swipe right from home screen but the app display is terrible. And then there's NFC python lib used to interact with the ruuvi.